In Brazil, inequality of land distribution, inadequate access to land by the poor, and insecure tenure are contributing factors to land degradation, destruction of forests, rural poverty, violence, human rights abuses, exploitation of rural workers, and migration to crime-ridden slums and shantytowns in urban areas. In spite of numerous programs to facilitate access to land, issues remain, particularly for landless peasants. 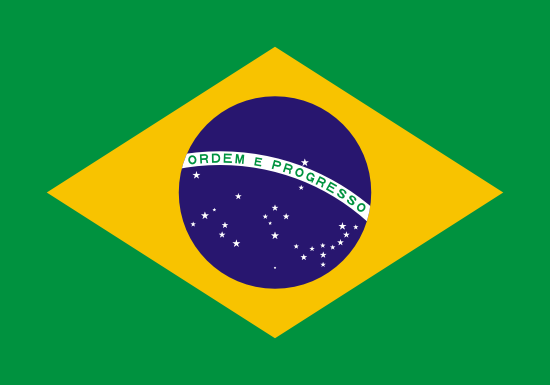 Brazil is an economic giant, with one of the world’s 10 highest gross domestic product (GDP). In recent years, sound macroeconomic policies have brought about stability and growth; and innovative social programs and inclusive economic growth have reduced both poverty and income inequality. The World Bank reports reductions in poverty (defined as US $2 per day measured in purchasing-power parity terms) from 20% to 7% of the population, and in income inequality (as measured by the Gini index) from 0.596 to 0.54 between 2004 and 2009. Despite these achievements, inequality remains at relatively high levels for a middle-income country (World Bank 2010). A significant part of Brazil’s economy relies on the use of its immense natural resource base. As a consequence, Brazil faces the challenge of productively harnessing its resources and realizing the benefits of agricultural growth while still ensuring adequate environmental protection and achieving development that will be sustainable. Brazil possesses 12% of the world’s reserve of available freshwater. Geographically, these resources are extremely unevenly distributed, with nearly three-quarters concentrated in the sparsely populated Amazon River Basin. Brazil’s wetlands are under pressure, and water pollution and availability issues exist in southern Brazil. With support from international donors to govern its freshwater resources more efficiently, Brazil has managed to increase water supply and sanitation coverage to poorer sections of the population, but affordability remains a question. Brazil hosts extensive forests, grasslands, and wetland ecosystems. Despite legal provisions to provide protection to an estimated 3.7 million square kilometers of public and private lands, there are significant human and development pressures on all of these areas. Governance responsibilities are spread throughout Brazil’s legal framework for the environment and forest areas, resulting in disputes between various state and federal-level institutions. Brazil has one of the largest and most well-developed mining sectors in the world. However, it is still working to clarify precise roles and responsibilities of the federal, state, and municipal governments in administering the mining sector to avoid confusion and conflict. Laws and policy on small and medium-sized mining companies also need clarification. Although artisanal miners are recognized in the Constitution, the laws and policies remain vague regarding their rights over certain minerals (e.g., industrial minerals). Also, mineral deposits often lie within indigenous lands, creating conflicts, sometimes violent, between indigenous communities and artisanal miners. USAID programs in Brazil focus on environment and natural resources management, health, job creation for disadvantaged youth, and clean energy. These include programs supporting conservation efforts in the Brazilian Amazon and strengthening indigenous organizations. Given that all USAID activities in Brazil respond to directed funding from Congress, USAID is not currently engaged in land and resource tenure-related activities and has no future plans to do so. Brazil has one of the highest levels of inequality of land distribution in the world. Inadequate access to land by the poor and insecure land tenure are factors behind rural poverty, violence, human rights abuses, and exploitation of rural workers in conditions of servitude. Lack of available land causes thousands of Brazilians to settle in slums and shantytowns in urban areas controlled by gangs engaged in drug trafficking and violent crime. Pursuant to the Constitution, Brazil has initiated numerous programs to facilitate access to land for the landless through state-led approaches involving expropriation and redistribution of idle or unproductive lands, settlement on government-owned lands, market-assisted land reform providing subsidized loans to the landless for purchase of farms, and tenure regularization for indigenous and Afro-Brazilian communities. However, issues remain, particularly for landless peasants. Meanwhile, large farms continue to displace smallholders who lack formal land titles, resulting in social movements that pressure the government to promote reform. Brazil possesses 12% of the world’s reserve of available freshwater. However, geographically, these resources are extremely unevenly distributed. Nearly 73% of Brazil’s freshwater is concentrated in the sparsely populated Amazon River Basin. Brazil supports a section of the Pantanal wetland, one of the largest continuous wetlands in the world, which is under pressure from expansion of large soy and sugar plantations. Water pollution and availability issues exist in the industrialized south and southeast, which is home to nearly 60% of the population. Brazil has attempted to decentralize governance of freshwater resources but continues to struggle with inclusion of local institutions in decision-making. In terms of water supply and sanitation, Brazil is increasingly promoting private sector partnership with support from international donors. This is increasing coverage to poorer sections of the population, but affordability for the poor remains a question. Brazil hosts extensive forests, grasslands and wetland ecosystems. These include: the Amazon forest, which comprises nearly 49% of the national territory; the Atlantic rainforest; the Cerrado (tropical grassland in the central and southwestern); and the Caatinga (dry shrubland and thorn forest in the northeast). Brazil’s rainforests account for nearly one-half of the world’s remaining rainforests. The Amazonian ecosystem in particular provides critical national and global services. It serves as a major carbon reservoir and regulator of climate in the region, and it is a producer of freshwater and other aquatic ecosystem services. It also supports some of the greatest biodiversity in the world in terms of species of plants, insects, fishes, birds, and mammals. Studies suggest that reduction in Amazon forest would mean significant loss in global biodiversity, reduced basin-wide precipitation and water cycling (including long-range water transport to neighboring countries), and would contribute significantly to global warming (World Bank 2008; Fearnside 2005). Economic growth and agricultural policies have allowed opening up the forest frontier and clearing of forests for soybean and cattle-ranching. Meanwhile, to address land-related inequities and the high levels of landlessness, small farmers have been provided forest lands for cultivation. The current legal framework provides some form of protection to an estimated 3.7 million square kilometers of public and private lands in the form of conservation units (protected areas), indigenous lands, permanent preservation areas (APPs), and legal reserves. Despite the legal provisions, significant human and development activities continue to put pressure on all of these areas. In particular, the APPs and legal reserves on private lands have been subject to widespread illegal land-use, many of which fall within agricultural landscapes. Both state and indigenous forest lands have been sites of large infrastructure development, settlement of landless people, and allocation of lands to latifundios (large plantation farms) or large-scale cattle-ranching. Brazil’s legal framework in the environmental and forestry areas spreads governance responsibilities among a number of state- and federal-level institutions, which can create confusion, resulting in disputes between the state and federal-level institutions. Numerous government initiatives are attempting to conserve the country’s forest resources. These include the Inter-Ministerial Working Group for the Reduction of Deforestation in the Legal Amazon. Established in 2003, this group is playing an important role in coordinating policies affecting the Amazon region. In addition, USAID, the World Bank, and the Global Environment Facility (GEF) are supporting a number of conservation programs in each of the principal biomes in Brazil. Brazil has one of the largest and most well-developed mining sectors in the world. Minerals are managed by the National Department for Mineral Production (DNPM) within the Ministry of Mines and Energy. Through concessions and permits, the DNPM grants rights to extraction of mineral resources to mining companies and artisanal miners (individuals or cooperatives). The laws also assure landowners, municipalities, states, and the federal government a share of exploited mineral resources in their respective territory or compensation for this exploitation. However, laws defining the precise roles and responsibilities of the union, state, and municipal governments in the granting, administration, monitoring, and enforcement of mineral concessions and mines can be confusing, resulting in conflict between the various layers of the government. Laws and policy on small- and medium-sized mining companies are also contradictory at times. Although artisanal miners are recognized in the Constitution, the laws and policies regarding their rights over certain minerals (e.g., industrial minerals) remain vague. Mineral deposits sometimes lie within indigenous lands, and violent clashes between indigenous communities and artisanal miners have been reported. Brazil has a total land area of 8.5 million square kilometers. Agricultural land makes up 31% of the land area, forests 56%, and grasslands 13%. Protected areas (including forests) account for 18% of this land area. Approximately 4.4% of the agricultural land is irrigated, but the potential for irrigation is more than twice as great, extending over 10% of the agricultural land. Family agriculture is important, accounting for 30% of the farming area, 38% of output, and employing over 14 million people (Food and Agriculture Organization (FAO) 2008; International Fund for Agricultural Development (IFAD) 2008). The population of Brazil is estimated at 193 million, of which approximately 14.8% is rural. The indigenous population, comprising over 200 ethnic groups, amounts to between approximately 180,000 and 350,000 people. Afro-Brazilians make up 45% of the population (FAO 2008; Survival International n.d.; Hutchison et al. 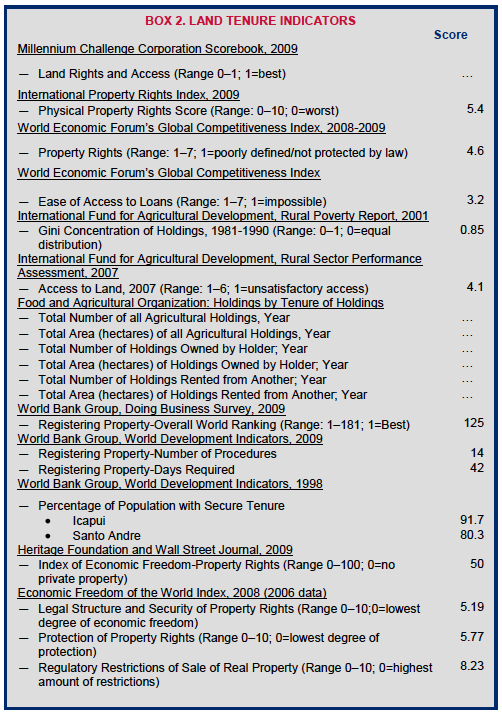 2004; United Nations Human Settlements Programme (UN-Habitat) 2005). 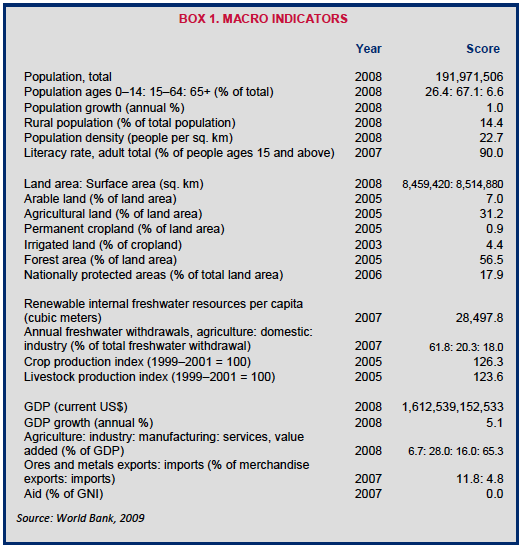 Brazil’s GDP is US $1.6 trillion, with 6.7% attributed to agriculture, 28% to industry, and 65% to services (see Box 1). Brazil leads the world’s exports in a number of agricultural commodities including soybeans, beef, sugar, ethanol, and others. Agriculture constitutes a significant source of export earnings and employment, accounting for 28% and 21% respectively. The growth of soybean cultivation has been dramatic, expanding from three million hectares in 1970 to 18.5 million hectares in 2003. Soybeans are widely used for biodiesel, while sugarcane is primarily used for bioethanol. Approximately 50% of the country’s annual sugarcane crop goes towards the production of bioethanol (World Bank 2008; IFAD 2008; Bickel and Dros 2003). Soybean and sugarcane cultivation is continuing to expand into natural ecosystems such as forests, wetlands, and pastures. Unsustainable farming practices are leading to high levels of soil erosion and nitrogen pollution, sedimentation of streams and aquatic systems, and degradation of riparian ecosystems (Martinelli and Filoso 2008). An estimated 1% of the population owns 45% of all land in Brazil. Nearly five million families are landless. According to the National Institute on Colonization and Agrarian Reform (INCRA), there are nearly one million square kilometers of uncultivated land in the country. Indigenous people have secure land rights to approximately 12% of Brazil’s land area. Indigenous lands are the property of the government; however, the law guarantees indigenous people perpetual use rights to those lands (Centre on Housing Rights and Evictions (COHRE) 2003; Kothari 2004; Ortiga 2004). In particular, the Constitution guarantees to indigenous peoples permanent possession and exclusive use of their traditional lands including soils and waters, but excluding subsurface such as minerals (Government of Brazil (GOB) Constitution 1988, Art. 231; Anaya and Williams 2001; Hutchison et al. 2004). The Constitution also guarantees ownership rights of Afro-Brazilian communities to their traditional lands, quilombo (villages established by former slaves). The state is obligated to issue titles to these communities; however, of the 743 remaining communities, only 42 have been legally recognized and 29 titled as of 2005 (GOB Constitution 1988, Art. 68; UN-Habitat 2005). The expansion of large-scale soy and sugar farms is increasing land concentration, displacing small-scale farmers and others who lack official proof of land ownership. Once land is cleared for soy cultivation, opportunities for employment are limited due to mechanization of agriculture, and farmers migrate to slums in urban areas or to forests to clear new farmland (van Gelder and Dros 2006; Noronha et al. 2006). The Constitution guarantees land ownership as a fundamental right. The Constitution recognizes customary land rights of the indigenous groups. In addition, Brazilian law allows acquisition of land through unchallenged possession for a specified number of years (usucapio or usucapt). In the event of a land-taking however, such owners are often entitled to meager compensation (Castro, Barros, Sobral, Gomes, Advocates (CBSG) 2007; Cotula et al. 2008). The 1964 Land Statute (Law No. 4504) regulates rural lands and governs Brazil’s redistributive land reform program and the related issues of transfer and acquisition. The law strengthens the rights of tenant farmers and sharecroppers (Barsted 2005; Kaimowitz and Smith 2001). The Law on Union Land (Law No. 9,636) deals with regularization, administration, alienation and leasing of union lands (i.e., government lands) (UN-Habitat 2005). The 1966 Law No. 4947 establishes and regulates agrarian reform; the 1981 Special Law for Occupation allows recognition of squatter rights; and the 1998 Law No. 93 establishes a National Land Fund. Numerous other legislation and decrees govern other aspects of Brazil’s land policy, including the land reform program. The Civil Code of 2002 (Law No. 10.406) deals with family rights, inheritance, possession and property rights (UN-Habitat 2005). Rural land rights are governed by the Constitution, the Land Statute, and the Civil Code. Rural tenure types include individual and collective ownership (freehold tenure including purchase and sale of land); rural adverse possession; formal and informal lease or rent (including sublease of land); and use rights (UN-Habitat 2005). Urban land rights are governed by the Constitution, the Civil Code, the City Statute, and Federal Law 8,245 of 1991. There are many urban tenure types in Brazil. Land may be acquired for ownership through purchase and sale of real estate, and urban adverse possession. Formal lease and rent include lease of land and housing, and rent or sublease of housing. Informal lease or rent includes lease and sublease of land and housing and informal rent of multi-family collective housing (tenements); these arrangements are characterized by low security of tenure. Use rights include special concessions for use of public land, including Special Concession for Housing Purposes, the collective form of which is used in informal settlements, and Concession of Real Right to Use which is used to regularize informal settlements and for social housing programs (UN-Habitat 2005). Land can be acquired through purchase, transfer of ownership (e.g., through inheritance), and government allocations. The right to acquisition of land through long occupation (usucapt) has existed in rural Brazil since 1916. Adverse possession in the current law allows legal transfer of land to the occupant gained after uninterrupted and undisputed occupation for a specified number of years (GOB Constitution 1988, Art. 191; GOB Civil Code 1916, Art. 1240). Foreigners can acquire urban lands without restrictions. Foreign individuals and companies may acquire rural land; however, in 2010, Brazil was contemplating a constitutional amendment that would restrict the purchase of agriculture land by foreigners or Brazilian subsidiaries of foreign companies. In August 2010, President Luiz Inácio Lula da Silva signed an order limiting the amount of land that may be acquired by foreigners and Brazil-based companies controlled by foreigners to 5,000 hectares (12,350 acres), and limiting holding sizes to 25% of the total area of the municipality where the land is located. For all land ownership, foreign individuals require proof of Brazilian residency, while foreign companies require incorporation under the Brazilian laws (Soares 2010, Soares da Silva 2007). Rental and sharecropping arrangements are common but lack security of tenancy and access to credit. The capacity of the government to provide tenure security is limited by inaccurate land registry, overlapping titles for the same parcels, and by the limited capacity to ensure protection from eviction even when boundaries are properly recorded and formal titles issued (World Bank 2000; Araujo et al. 2006). The Land Statute and state-led land reform create property rights insecurity on rural lands that are considered idle, as the laws permit land expropriation for land uses that do not fulfill a social function; however, the law fails to clearly define what uses constitute a social function. The government has been slow in implementing land reform and in expropriating (with compensation) and redistributing idle and underutilized lands; this in turn has resulted in the rise of the Landless Workers Movement (MST) and others, who mobilize rural workers to organize invasions as a means of forcibly acquiring land. In the meantime, legal protections have been accorded to the landless, tenants, indigenous and Afro-Brazilian communities, but their rights have not been secured (Araujo et al. 2006). Forced evictions are disproportionately affecting Afro-Brazilian communities, indigenous peoples, women, and the poor. Reports of evictions accompanied by excessive use of force, arbitrary detentions, harassment, or extrajudicial executions by the military police exist. Many indigenous lands continue to be encroached upon by landless peasants (campesinos), gold miners, and others. There is a lack of consolidated data on the numbers of forced evictions and the amount of land acquired through such evictions or the organized invasions noted above. However, COHRE notes that over a two-year period (2004–2006) it received information on evictions affecting 70,637 people in Brazil. This does not account for unreported evictions (COHRE 2008; Ortiga 2004). The Constitution provides for gender equality in obtaining titles to property; property rights or concessions under the agrarian reform program may be allocated to men and women either individually or as joint owners (GOB Constitution 1998, Art. 189; UN-Habitat 2005). The Constitution broadens the right of inheritance to partners in stable unions rather than limiting it to civil marriage. It recognizes equal rights for children born inside and outside of wedlock, including adopted children (GOB Constitution 1998, Art. 227; Barsted 2005). The 2003 Civil Code assures gender equality in the acquisition, management, and administration of property brought into the union or acquired after marriage. A couple may choose to hold all or some of their property jointly or separately. If they do not specifically elect how they will hold their property, the union is organized in a system of partial community of property, or common property. A woman has the choice of transacting property under her single or married name. If a couple is legally married, joint registration of their property is obligatory. Spousal consent is required if one spouse chooses to dispose of joint assets, whether it is in a stable union or marriage. Women and men have equal inheritance rights in case of death of a partner in a marriage or stable union (GOB Civil Code 2002, Arts. 1642, 1639–1641; Cotula 2002). While there may not be any legal obstacles preventing women from acquiring and owning land, customarily women are excluded from land inheritance practices. These customary practices continue to be applied in rural areas, particularly with regard to the exclusion of daughters from inheritance of land. Also, despite legal provisions and pressure from grassroots movements and rural women’s organizations, beneficiaries of agrarian reforms have been, largely, men. However, INCRA has begun paying special attention to women as preferential beneficiaries of land settlements (Guivant 2003; Barsted 2005; IFAD 2008). The responsibility for management of land is divided among the federal union, the state, and the municipalities. INCRA, the Ministry of Agrarian Development, and the National Secretary of Union Assets (subordinate to the Ministry of Planning) are responsible for administration of rural union lands. The National Secretary of Union Assets and the Ministry of Cities administer urban union lands. The Ministry of Agrarian Development, through INCRA, is responsible for the identification, recognition, delimitation, demarcation, and titling of lands occupied by quilombo communities. The states manage land and property through secretaries or departments of urban development, metropolitan affairs, housing and land companies, agrarian development, and public assets. Some states have created land institutes to identify and survey idle and inadequately used lands, and to register unregistered or abandoned land. Institutions charged with registration and titling remain inadequate, however, and require significant revamping in terms of titling and the creation of a national cadastre and registration system (UN-Habitat 2005; World Bank 2003). The National Indian Foundation (FUNAI), subordinate to the Directorate of Land Affairs under the Ministry of Justice, has the responsibility for managing indigenous lands. FUNAI is mandated to create and implement policy with regards to indigenous affairs in Brazil, in compliance with the 1988 Constitution. FUNAI’s land-related responsibilities include: 1) mapping and protecting lands traditionally inhabited and used by indigenous communities; 2) preventing invasions of indigenous territories by outsiders; 3) facilitating investigations and surveys of indigenous groups; 4) defending indigenous communities and developing programs to stimulate national interest in indigenous affairs; and 5) ensuring land supervision to prevent predatory activities by prospectors, squatters, loggers, mining corporations, and others. Like its predecessor the Indian Protection Service (SPI), FUNAI continues to be criticized by indigenous groups who accuse FUNAI of approving the development of roads, railroads, hydroelectric plants, and other enterprises on indigenous lands, failing to enforce definition of their lands, and preventing the invasion by the various interest groups (UN-Habitat 2005; Survival International n.d; Anonymous 2010). In Brazil, land registry is based on a descriptive system of property, lacking definition of the geographic location. This imprecision facilitates overlap in registrations. Also, rural records are collected and managed by INCRA, while municipal records are collected by the local public administration mainly for tax collection purposes. The municipality property records typically include those residing in informal settlements to facilitate collection of taxes. This causes further discrepancy between municipality records and the federal and state records (UN-Habitat 2005). Land access through the rental market is difficult for most peasants, smallholders, and rural workers; informal contracts are common. Property tax on rural land is symbolic, enabling landowners to hold vast idle or underutilized areas, hence preventing access by the landless. A great deal of economic activity is centered on land speculation, both in rural and urban areas (Buainain et al. 2008; Reydon 2006). While the 1964 Land Statute regulates land rental contracts to satisfy interests of both parties (e.g., through upper and lower limits on the duration of leases), it also creates many obstacles. Landowners often flout the law and impose terms that subject small tenant farmers to unfavorable productive conditions. Short-term contracts, high transactions costs and limited access to input, credit, and markets mean that tenant farmers perform poorly in terms of producing marketable surplus and are often unable to pay the rent for the land (Buainain et al. 2008). Municipal land rental programs seek to address the problem of underutilized and idle lands. However, they are unable to induce landowners and landless farmers to negotiate under equal conditions, or to provide conditions for tenant farmers to operate profitably on leased land (Buainain et al. 2008). The Constitution and the Land Statute allow for the compulsory acquisition of idle or underutilized land in the public interest (in Brazil, understood as interests of the state or government) or for redistribution to the landless with compensation to the landowner. In practice, some lands have been acquired by the government for redistribution under the land reform programs. However, in most cases the government has chosen to settle the landless on state lands instead, including forests. Thus, vast areas that qualify for acquisition have not been expropriated and redistributed (Domingos 2003). The highly skewed land distribution and government expropriation and redistribution policies are a major source of conflict in Brazil, taking the form of forced evictions or assassinations of rural workers, peasants (campesinos), lawyers, union leaders, and religious supporters involved in the struggle for land. Local landlords have been known to hire armed gunmen, military groups, or death squads to protect their properties, harass landless families, and hinder agrarian reform. Pará has a history of the worst violence and some of the greatest human rights violations against rural landless workers in Brazil. Indigenous communities face threats from ranchers, speculators, and timber companies. The Brazilian justice system has been accused of criminalizing activists rather than delivering justice against the assassins (Human Rights Watch (HRW) 2009; Alai-Amlatina 2003; Requiao and Delazari 2003; Aldrich et al. 2007; Center for International Environmental Law (CIEL) 2003; Amnesty International 2008a). Violence in rural areas compels landless families to flee to urban areas where they become squatters in informal settlements, struggling to find employment, housing, and food. This heightens tensions in the urban areas. The government does not always view informal settlements favorably, and has on occasions dispatched military police to dislodge the urban squatters. Violence and extrajudicial executions by police and criminal gangs in urban and peri-urban areas occur; a situation that is exacerbated by the influx of the landless (HRW 2009). Forced labor is a serious concern, exacerbated by the high concentration of land ownership. Forced labor is used in logging operations, alcohol and sugar refineries, and on large coffee estates (fazendas). Large landowners hire labor contractors to induce the rural poor into forced labor by promising attractive wages. Workers are required to pay the landowners for transport, boarding houses, food, and tools for work at high prices. Workers often fall into debt and are subjugated by the landowners. Since 1995 the federal government has taken steps to combat forced labor, however, the problem continues, and criminal accountability for offending employers remains rare (Sharma 2002; HRW 2009). The Brazilian justice system consists of the supreme federal court; the superior court of justice; courts of appeal; federal regional, district, state, and territory courts; labor courts; electoral courts; and military courts (UN-Habitat 2005). According to the Constitution, the court of justice shall designate judges in states for the settlement of land-related conflicts. The Constitution also designates the institution of the public defender (federal and state) as a key provider of justice for all; and may promote land access for the landless in land-regularization processes that involve the federal public lands (GOB Constitution 1998, Arts. 126, 134). The state judiciary may act in matters concerning possession of private or public state and municipal land, and to settle family disputes over land and property. However, the state judiciary is inadequate for dealing with such disputes, and complex matters involving property rights for the vulnerable are often settled unsatisfactorily or not at all. This is because, despite their training in law, judges lack the qualifications to appropriately handle issues of gender, inheritance rights involving disputed lands, and property rights and housing for socially vulnerable groups. Furthermore, low-income populations have difficulty accessing legal aid due to the high cost. The public defender at the federal- and state-level is responsible for the provision of legal advice to the poor, but lacks the finances. Finally, the judicial process can be slow, taking years or decades for cases to be tried in court. Increasingly human rights legal professionals are recognizing the need for establishing mechanisms of alternative dispute resolution and mediation, as for instance committees or councils of justice, or through the creation of neighborhood and district courts (UN-Habitat 2005; Amnesty International 2008b). Brazil has been actively pursuing agrarian reform since its return to democratic rule in 1985. The 1988 Constitution affirmed the government’s commitment to agrarian reform. The chapter on agrarian reform provides the state the right to expropriate unproductive rural land with fair compensation (GOB Constitution 1998, Arts. 184–191; Baranyi et al. 2004; UN-Habitat 2005). Since the adoption of the Constitution, the government has taken various approaches to land reform, including: state-led approaches involving expropriation and redistribution of idle or unproductive lands; settlement on government-owned lands; market-assisted land reform that provides subsidized loans to the landless (including groups of farmers) to purchase farms; and tenure regularization for indigenous and quilombo communities (IFAD 2008). Under the anti-hunger program, Fome Zero, the Brazilian government aimed to eradicate hunger and extreme poverty by 2006 by: providing food subsidies to the vulnerable and support for family-based agriculture; increasing the availability of credit for food production; and providing a guarantee from the state marketing agency to purchase all production from land reform settlements and other family farmers at a guaranteed minimum price. Land redistribution projects have been marginally successful. Although land ownership has increased among the poorest rural households, all other rural classes have seen a decrease in land ownership over the period of reforms (Assuncao 2006; Silveira et al. 2008). Market-assisted programs have been criticized for landless farmers’ inability to negotiate prices or the plot they acquire, and for placing farmers in high debt. INCRA settlements have seen high levels of abandonment due to poor beneficiary and site selection, and lack of infrastructure and beneficiary access to credit due to the low collateral value of titles issued. Full implementation of agrarian reform has also been inhibited by confusion in jurisdiction between the union, the state, and the municipality, slowing the expropriation process (Sauer 2006; UN-Habitat 2005). Women were largely excluded from the early land reform initiatives, as preference was given to male heads-of-household. According to the first census of the agrarian reform organized by INCRA in 1996, after 32 years of agrarian reform, only 12% of women had land registered under their name. The 1988 Constitution guarantees women the right to have agrarian reform land titled in their names. However, it was not until 2001 that the government altered the male land ownership practice and started to issue titles in accordance with the Constitution. No current statistics are available on how many women have been allocated such land and how many women have a joint title with their spouse (Guivant 2003; GOB Constitution 1988, Arts. 189, 183 ; UN-Habitat 2005). Furthermore, Law No. 13,770 of 29 January 2004 obliges municipal housing programs to give priority to women in the titling of property. But the impact of this law has yet to be realized. Increasingly, women have been taking part in the popular housing movements such as the Mutiroes (a popular housing program that uses government-supplied materials and volunteer labor). The Mutiroes program has been very successful, and a number of other programs by which women can obtain title to such newly built homes are being initiated (UN-Habitat 2005). USAID is not supporting activities related to land tenure reform in Brazil, nor is it contemplating doing so in the future. In years past, USAID has supported projects that served to strengthen land rights of indigenous communities through demarcation and protection of indigenous lands (Ballantyne 2010). The World Bank Group’s International Bank for Reconstruction and Development (IBRD) supported the Land- Based Poverty Alleviation Programs in Brazil (2000–2008), a US $202 million program implemented in 14 states of the northeast and southern regions. This program supported the community-based land reform initiative, assisting community associations of poor farmers to obtain loans for land purchases and to improve productivity of their lands. This project was preceded by two World Bank pilot projects: the Land Reform and Poverty Alleviation Pilot Project (1997–2002) and the Ceará Rural Poverty Alleviation Project (1996–1997) (World Bank 2009b). In addition, the Inter-American Development Bank (IDB) is supporting the US $10.8 million Cadastre and Land Regularization Program to improve rural land titling in Brazil. The program seeks to increase the efficiency of land-administration procedures through physical and legal guarantee of land-ownership rights, creation of the National Cadastre of Rural Real Estate, and updating of real-estate registries. In addition, the IDB is financing a US $23 million Tenement Action Program in the state of São Paulo that aims to improve the quality of life of poor families living in tenements in the downtown areas of municipalities in São Paulo by financing housing options, renovating existing tenements, and promoting urban renewal (IDB 2004). IFAD-funded operations include the Sustainable Development Project for Agrarian Reform Settlements in the Semi-Arid North-East. Activities contribute to increasing incomes and improving livelihoods of small farmers by promoting water security, enhancing agricultural development and natural resource management, and improved access to infrastructure and other services (IFAD 2008). Over the last 25 years a number of social movements have contributed actively to the land reform process by: 1) obtaining access to contested land that was once worked by peasants; 2) occupying forfeited lands or land belonging to the state in frontier areas; and 3) occupation of large plantation farms (latifundios). These social movements include the Brazilian Landless Worker’s Movement (Movimento dos Trabalhadores Rurais Sem Terra (MST)), the church (in particular the Catholic Church’s Comisão Pastoral da Terra (CPT)), the rural workers’ union (Confederação Nacional dos Trabalhadores na Agricultura (CONTAG)), and the Rubber Tappers Movement in the Amazon. In addition, there are approximately 65 smaller organizations engaged in the struggle for land at the regional and state levels (Fernandes 2005; Ondetti 2008; Guivant 2003; Baranyi 2004). Brazil possesses 12% of the world’s reserve of available freshwater, with more than 20,000 square kilometers of marshlands, reservoirs, and estuaries. The Pantanal wetlands, shared with Bolivia and Paraguay, are a critical freshwater ecosystem and one of the largest continuous wetlands in the world, extending over 0.15 million square kilometers. The largest part of this floodplain lies in Brazil. Pressure on the Pantanal comes from expansion of large soy and sugar plantations and other agribusiness projects (Suplicy 2004). Water resources in Brazil are extremely unevenly distributed. About 73% of Brazil’s freshwater is concentrated in the sparsely populated Amazon River Basin. Water pollution and availability issues exist in the industrialized south and southeast, which is home to nearly 60% of the population. Coverage rates in rural areas are significantly lower than in urban areas in all geographic regions, but remarkably so in the north and northeast. In the north and the northeast regions combined, 76% of the urban population in 2004 had access to water supply, compared with 98% in the urban areas of the south and southeast regions. Similarly, in the rural areas of the north and northeast region, only 35% had access to water, compared with 90% in the rural areas of the south and the southeast (World Bank 2006; de Oliveira 2008). Despite a large coast line and an Exclusive Economic Zone of 4.5 million square kilometers (sea-zone over which Brazil has special rights over the use of marine resources), fisheries and aquaculture account for only 0.4% of Brazil’s GNP. Fishing occurs both on an industrial scale and on a small scale, and represents an important part of the subsistence and cash economy (Suplicy 2004). Water is regulated in a number of Articles in the Constitution, including Article 21, which calls for the establishment of a national system of water resources management and defines criteria for granting rights of use; the 1997 National Water Resources Policy (NWRP) (Law No. 9,433); and the 2000 National Water Agency Law (Law No. 9,984). Other laws regulating water resources include the 1988 Coastal Management National Plan (Law No. 7.661) and the 1967 Fishing Code (Salman and Bradlow 2006; Suplicy 2004). According to the NWRP, water is public property. The Constitution’s Article 20 enumerates the property of the union, which includes: lakes, rivers, and any watercourses on land that it owns; interstate waters; water bodies that serve as national borders; and waters that extend into or come from foreign territory. Article 26 stipulates that the property of the states includes surface water and groundwater. The NWRP specifies uses of water that require government permit. Such uses include: diversion of water, including public water-supply or use in a production process; extraction of water from aquifers for consumption or for use in a production process; use of hydropower potential; and other uses that affect flow, quantity, or quality of water existing in a body of water. Use of water by small rural populations do not require government award. The NWRP stipulates that management of water should be decentralized to include users, and requires that water-use plans be developed for each river basin and state, and for the country. In practice, some argue that the government does not enforce its rights as owner and deny or restrict use of water resources (Salman and Bradlow 2006; McNallen 2006). The National Water Agency (ANA) Law grants the ANA authority over the NWRP. The National Water Resources Management System consists of the National Council of Water Resources, the State and Federal District Councils on Water Resources, the River Basin Committees, and others. The system is responsible for: integrated water-resources management; arbitrating conflicts; implementing the NWRP; planning, regulating, and supervising the use, conservation, and recovery of water resources; and encouraging the charging of fees for water usage. The River Basin Committees are authorized as the first administrative recourse for arbitrating conflicts related to water resources. The NWRP also provides for the creation of legally constituted civil water resource organizations‖ that include regional, local, and sectoral water-users associations (Salman and Bradlow 2006). The Special Secretariat for Aquaculture and Fisheries (SEAP) created by Law No. 10,683 of 2003 is the main authority for the management and development of fisheries and aquaculture in Brazil. Another focal institution for the management of fisheries is the Brazilian Institute for the Environment (IBAMA) (Suplicy 2004). The Fisheries Code allows for formal comanagement agreements and informal local community agreements for use of fisheries resources. The Fisheries Council, composed of representatives of communities sharing a given lake system, is responsible for preparing and implementing fishing agreements, which are submitted to IBAMA for legal recognition. Monitoring and enforcement activities are organized by Volunteer Environmental Agents composed of community members trained by IBAMA (Suplicy 2004; McGrath et al. 2007). Until the 1960s, water and sanitation services were provided by municipalities or, in some cases, state departments. This began to change in 1971 when Brazil instituted the National Sanitation Plan (Planasa). The Plan promoted the creation of state water and sanitation companies (CESBs), and encouraged municipalities to grant long-term concessions to CESBs on the grounds that this would help capture economies of scale, particularly in large metropolitan areas, while reducing planning costs. This resulted in a significant increase in coverage of water supply and sanitation provision in urban areas of Brazil. By the end of the 1980s, the Planasa system began deteriorating due to the economic downturn, dwindling investments, lack of appropriate financing, and mismanagement. Today, water supply and sanitation services in Brazil continue to follow guidelines established by Planasa. Municipal provision of water and sanitation services is concentrated mainly in larger southern and southeastern states, either through agencies under direct municipal control, autonomous agencies, or municipal companies. In many areas, the CESBs continue to hold concessions from municipalities. Since the mid-1990s, Brazil has been experimenting with private sector participation in the water and sanitation sector in various forms, concession contracts being the most common type of contracts. In the urban areas, nearly 32 of the estimated 1,350 water and sewerage entities have been privatized, serving 25% of the population. Studies show that private sector participation has improved access to water, especially for the poor. However, affordability of water services, particularly by the less privileged sections of the population, remains a question (de Oliveira 2008). With donor support, ANA is implementing numerous water projects with a focus on: water provision to the rural poor; decentralized and participatory water management (e.g., through River Basin Committees); early warning of flood risks; water conservation and quality improvement; and water-pricing and water-fee projects. However, contradictions remain between the calls for decentralization and top-down exclusionary approaches. Moreover, government policies have continued to place excessive effort on the introduction of water pricing and fees at the expense of conservation and public participation (Ioris 2009). The World Bank has historically and is currently supporting a number of water projects in Brazil. The Pernambuco Sustainable Water Project, a five-year (2010–2015) US $410 million initiative that aims to improve sustainable water supply and sanitation for the populations residing in the Capibaribe river basin and the urban areas of Recife. The Project supports the Government of Pernambuco to improve water sector management through institutional development; it also supports the Pernambuco State Water Supply and Sanitation Company (COMPESA) to increase the company’s operational and economic performance; and it is supporting the expansion of water supply and sanitation service to a wider geographic area. The Ceara Integrated Water Resource Management Project (2000–2011) is a US $247.26 million program aimed at improving watershed management to enhance conservation, minimize erosion, and maximize natural water storage mechanisms through improved management of critical micro-basins and groundwater resources. It is aimed at: 1) improving water supply from the Castanhgo dam in the Jaguaribe river basin to over three million people in the Fortaleza Metropolitan Region and 2) implementation of additional water storage and supply sub-projects to cover small towns and rural areas. The US $233.5 million Integrated Water Management in Metropolitan São Paulo project (2009–2015) aims to protect and maintain the quality and reliability of metropolitan São Paulo’s water resources and provide improved water supply and sanitation services to the poor through wastewater and solid waste management improvements and water supply system improvements. The US $64.5 million São Paulo Water Recovery Project – REAGUA (2010–2015) aims to improve water quality and availability in the state of São Paulo’s critical watersheds. The Espirito Santo Water and Coastal Pollution Management Program (2005–2012) is a US $107.5 million project designed to improve the efficiency of the water supply and sewerage systems of the State Water Company of Espirito Santo (CESAN) and to increase CESAN’s coverage level in provision of water and sanitation services. Lastly, the Integrated Management of Aquatic Resources in the Amazon (AquaBio) Project (2006–2012) is a US $17.1 million program supporting the mainstreaming of multi-stakeholder integrated management and conservation of aquatic resources in the Brazilian Amazon River Basin, and capacity-building for local stakeholders in participatory implementation and monitoring of project activities (World Bank 2009a; World Bank n.d.). The International Finance Corporation (IFC) is proposing to support the private sector in improving water supply and sanitation in Brazil. Under the DESO’s Institutional Development Project (PRODESIN), the IFC has proposed US $11 million to support the water supply and sanitation company DESO to help control water loss and improve efficiency in delivery of services in the metropolitan region of Aracaju in the State of Sergipe, located in the northeast region of Brazil (IFC n.d.). USAID has not been an active player in the water sector in Brazil, and has no future plans to work in the sector. However, from 2000 to 2005 USAID supported a water and energy efficiency project (Watergy), implemented in Brazil’s northeast region in partnership with the Ceará state water utility, Companhia de Água e Esgoto do Ceará (CAGECE), and the Alliance to Save Energy aimed to: promote energy and water efficiency; reduce costs to consumers and utility companies; decrease environmental impacts; and improve water delivery (USAID n.d). Brazil holds nearly one-half of the world’s remaining rainforests, including a majority of the Amazon rainforest. A significant portion of Brazil’s forest cover is found in the Amazon Basin, which is a mosaic of ecosystems and vegetation types including rainforests (primary ecosystem), seasonal forests, deciduous forests, flooded forests, and savannas. Approximately 95% of the existing natural forests in Brazil are in the Amazon (Roesch et al. 2009; Macqueen 2003; Tomaselli and Sarre 2005). Amazonian ecosystems provide national and global services; it is a major carbon reservoir and regional climate regulator, home to extensive biodiversity, and a producer of freshwater and other aquatic ecosystem services. In addition to the Amazon forests, which comprise 49.3% of the Brazilian territory, Brazil hosts: the Atlantic rainforest (originally 13% of the national territory, now 7%); the Cerrado (tropical grassland in the central and southwestern part of Brazil, 23.9% of country’s land area); the Caatinga (dry shrubland and thorn forest in the northeast, 9.9% of country’s area reduced in area by 96%); and the Pantanal (1.8% of the national territory). In particular, the primary forest areas (Amazon and Atlantic forests) account for approximately 56.3% of the national territory (World Bank 2008; FAO 2008; Roesch et al. 2009). The Amazon region is home to 20 million people. Millions of farmers live within or adjacent to dense forests and depend on them for various timber and non-timber forest products. Nearly one-third of the Amazon forest has been degraded due to expansion of soy and other agriculture, cattle-ranching, mining, logging, hydroelectric projects, and infrastructure development such as roads and highways. Tenure insecurity is contributing to deforestation as landowners clear the forest in order to protect their land rights, while landless farmers try to occupy large underdeveloped landholdings and clear forests as a proof of land development (Azevedo-Ramos 2008; Araujo et al. 2006). The Pantanal and Cerrado are experiencing similar pressures. In particular, the expansion of large agribusiness (soybean) and ranching has caused the removal of nearly 50% of its original two million square kilometers. In the Pantanal, unplanned settlements of the uplands, indiscriminate farming practices, cattle-grazing, illegal mining, construction of hydroelectric power plants, and mineral extraction are threatening the integrity of this wetland ecosystem. There is a high level of illegal extraction of timber resources from protected areas, state forests, and private lands (Macqeen 2003). Brazil’s forest sector accounts for 6.9% of Brazil’s GNP and 7.14% of Brazil’s exports. Between 1993 and 1995, the sector generated an estimated annual revenue of US $ 53 billion (Lele et al. 2000). The Brazilian Constitution stipulates that the federal, state, and municipal governments have the duty for ecological preservation, including that of forests. Other forest legislation in Brazil includes: the Forest Law of 1965 (amended), and the Law of Protection of Fauna of 1967. The 1965 Forest Law (Law No. 4,771) introduced the idea of forest management in the Brazilian law to accommodate the growing export of tropical timber, but it provides little guidance on what sound management might entail. The Forest Law covers not only the forests but also all other biomes such as the Cerrado, the Caatinga, the Pantanal wetlands, the Atlantic Forest, and the grassland of South Brazil (Pampa) (Sparovek et al. 2010). The law on sustainable management of forests was introduced in 1986 (Law 7,511). In 1989, IBAMA for the first time developed guidance on the development of a forest management plan (Order of Service 002/89), which was incorporated into Decree 1,282 in 1995. Since then, Brazil has adopted numerous legislative measures for forest protection and conservation. These include Decree No. 3,179 of 1999 establishing penalties for forest crimes, and Decree No. 3,420 of 2000 creating the National Forest Program (PNF). The PNF attempted to support commercial logging while safeguarding social and environmental protection. It lends a combined vision of promoting sustainable forestry in support of domestic and export market growth, generating jobs, while providing for environmental goods and services. Additional legal measures limit deforestation on private lands in Brazil. These include Provisional Measure 1,511 of 1996 which places limits on deforestation on privately owned forest land in the Amazon to 20%, and Decree 1963 of 1996, which suspends mahogany extraction from these lands (Macqueen 2003). Recognizing the limits of earlier policy development in the forest sector, Brazil adopted Law No. 9,985 of July 2000, which created the National System of Nature Conservation Units (SNUC). The law details criteria and guidelines for the creation and management of conservation areas (Toni 2004). In 2006, the government instituted the Law on Management of Public Forests (Law No. 4,776) to address illegal logging, promote responsible timber harvesting, and involve the private sector, communities, and others. It also creates the Brazilian Forest Service, responsible for granting forest concessions (i.e., the right to harvest timber in a sustainable manner). Income generated is to be used to finance the Forest Service and IBAMA, the state, the municipalities, and the National Fund for Forest Development (PNDF) to finance research, extension services, monitoring of forest activities, enforcement of rules, and conservation initiatives (Thiel and Viergever 2006). Local communities have been accorded commercial forest rights under several pieces of legislation. The 1988 Constitution provides these communities rights to extractive reserves. In addition, the 2004 Presidential Decree based on Law No. 9,985 grants local people long-term use rights to extractive reserves on federal and state lands. The PNF allows communities varying degrees of commercial forest rights, including rights to extractive reserves on forests on new agricultural settlement areas (Rylands and Brandon 2005; Toni 2006; Larson et. al. 2008). In Brazil, the permanent forest estates (public and private lands set aside for forests and subject to some form of regulation or protection) include: 0.48 million square kilometers of conservation units, including national parks, national forests, extractive reserves, biological reserves, and other categories of protected areas; 1.03 million square kilometers of indigenous lands; and 0.20 million square kilometers of government-owned APPs, including ecological and biological stations, and other sites; and 1.98 million square kilometers of legal reserves. This totals nearly 3.7 million square kilometers of area under some form of protection. The APPs are belts of forests on the edges of rivers, lakes, and lagoons, in upland catchments, watershed divides, margins of natural lakes and lagoons, riparian areas, hilltops and steep hillsides, and other environmentally sensitive areas on public and private lands which are critical to the preservation of biodiversity and ecological integrity of an area. Legal reserves are specific areas of farmland reserved to promote fauna and flora biodiversity-conservation and sustainable use of natural resources; although reserved for native vegetation, these can contain low-impact production systems including agroforestry or managed low-impact extraction of forest resources (Tomaselli and Sarre 2005; Sparovek et al. 2010). Overall, conservation objectives have been much more effectively met in conservation units (i.e., protected areas) and indigenous lands than on private lands (i.e., APPs or legal reserves). The current legal framework for protection of native vegetation, water, and biodiversity on private farmland is largely ineffective. Illegal land-use in legal reserves and APPs is widespread. For example, in Mato Grosso, where a large part of the recent agricultural expansion has taken place, the legal reserve deficit is about 90,000 square kilometers or 26% of present agriculture. In the state of São Paulo, the major sugar-cane-producing state in Brazil, the deficit is about 26,000 square kilometers or 13% of established agriculture (Sparovek et al. 2010). While relatively more effective than APPs or legal reserves, indigenous lands face numerous development pressures, including: road development projects; government policies to settle landless people and small-scale agriculture; large corporate settlements and latifundios; or large-scale cattle-ranching (Hutchison et al. 2004). Logging pressures have been high particularly along roads, both by logging companies and in some cases support from the indigenous peoples who upon demarcation of their lands sold logging rights to third parties. Moreover, mining activities of large companies and artisanal miners (garimpeiros) have challenged the integrity of indigenous lands. The Ministry of Environment (MMA), the National Environmental Council (CONAMA), and IBAMA are the primary institutions of forest management. In addition, the INCRA and FUNAI have responsibilities in forest management, the latter in relation to forests on indigenous lands. The MMA is responsible for planning, coordinating, and controlling activities related to the National Environment Policy, and policies for developing the Amazon. It provides oversight to activities of IBAMA, chairs the CONAMA, and takes part in the President’s Chamber for Natural Resources. IBAMA implements the national forest policy, administers forests nationwide, and monitors forestry programs. The IBAMA enforces compliance with the Forest Code through its regional offices in each state, with the support of armed forest police battalions in case of violent confrontations with illegal loggers. The CONAMA is the policy-development and consulting arm of the MMA, with strong representation from civil society, including nongovernmental organizations (NGOs) (Tomaselli and Sarre 2005; Rylands and Brandon 2005). Brazil’s legal framework in the environmental and forestry areas leaves room for gaps, overlaps, and power disputes in relation to governance responsibilities. The relationship between state-level institutions and the traditional federal institutions such as IBAMA could be better defined. State-level institutions are given responsibility for the implementation and enforcement of environmental legislation. Some states exercise autonomy in forest management (e.g. São Paulo, Minas Gerais, Paraná, Rio Grande do Sul, and Goiás), while other states (Bahia, Ceará, and Mato Grosso do Sul) suffer from overlapping jurisdiction and disputes between the state environment agencies and IBAMA. In the Amazon states, establishment of shared or decentralized management deals is becoming increasingly common (Macqueen 2003). In terms of granting licenses to timber industries, responsibilities are divided between agencies based on the scale of activities. Resolution 237/1998 of the CONAMA grants it the responsibility to issue licenses for timber harvesting. However, IBAMA (federal government) is responsible for licensing activities with nationwide impacts. States and municipalities license activities with impacts restricted to their territories. In practice, there is a struggle among municipal, state, and national environment organizations over the licensing of large-scale activities, and activities that generate more resources for environmental agencies are often a reason for disputes. Often, licensing responsibilities involving high operational costs, little revenue, and political burdens are left to the municipalities. Meanwhile, enforcement of forest management laws and regulations, and cases of bribery and corruption remain an issue (Toni and Pacheco 2005). Since the 1960s, Brazil has provided various incentives to promote reforestation, including tax incentives to private companies establishing plantations. While effective in increasing the area under tree cover, these programs were costly and difficult to monitor. State programs in Minas Gerais and Paraná that have provided incentives for reforestation to small and medium land holders are proving more effective than incentives for large plantations (Viana et al. 2002). Recent government programs have substantially increased lands under protection and doubled the area of forest under sustainable forestry. Between 2005 and 2006, the government established 0.20 million square kilometers of new federal protected areas in the Amazon, bringing 48% of the Brazilian Amazon under some kind of protection. The federal government also regularized another 0.40 million square kilometers of indigenous lands. The 2000–2010 PNF aims to: promote sustainable use, reforestation, and conservation of protected areas and reserves; control deforestation and illegal activities; and prevent forest fires. It aims to bring 0.50 million square kilometers of national forests under sustainable management by 2010 and establish 0.20 million square kilometers of forest plantations on private lands. The success of these initiatives is not yet known (Azevedo-Ramos 2008; World Bank 2008; Tomaselli and Sarre 2005). In June 2009, President Lula da Silva approved the Provisory Measure 458 that sought to privatize 0.67 million square kilometers of public land, legalizing landholdings of approximately one million squatters in the Amazon. While the bill was intended to reduce violent conflict over land and allow enforcement of rules regarding illegal felling of trees, environmentalists fear that the law may give free reign to land-grabbers and those responsible for deforestation of the Amazon (Sibaja 2009). In 2008, the Government of Brazil developed the Sustainable Amazon Plan. The Plan outlines guidelines for environmental management and land-use planning, promoting sustainable development, improving infrastructure, and reducing social inequities by creating new jobs to be achieved through specific programs. One specific activity is helping farmers in the Amazon region to develop sustainable sources of income and help them transition away from illegal logging (United Nations Environment Programme (UNEP) n.d; Guardian 2008). Increasingly the government is regularizing timber extraction and requiring that management plans be developed for timber extraction areas. It is estimated that currently an estimated 80% of wood extraction in the Amazon is legal, backed by logging permits. The remaining 20% comes from illegal sources (e.g., extracted from conservation units or have irregular management plans). Issues remain however, with the management plans and issuance of logging permits. Many small farmers are not able to afford the cost of preparation of forest management plans and the bureaucratic processes involved. Costs are high even for extractive reserves that allow for collective management plans. Legitimate landholders are not always able to produce documentation proving land ownership. These include small farmers settled by INCRA, as few of them have received titles or other proof of ownership. Others have obtained fraudulent land deeds to reflect land ownership. Thus logging permits do not always have a legal basis. A study conducted in 2000 showed that 62% of the management plans in Pará had falsified landownership documentation (Fabiano 2006; Semarldi 2003). Certification has expanded rapidly in Brazil and has become a major catalyst of change in forest management. In 2004, Brazil was ranked as the leader in terms of Forest Steward Council (FSC) certification in the tropics. Demand for certified timber is outstripping supply. Currently, forest plantations outside of the Amazon region constitute the major part of certified forests in Brazil. There is a need for expansion of certified timber from natural forests. Important challenges include: financing the costs of conversion to certified standards; training of workers and managers; and building capacity for developing equitable partnerships between communities and private sector enterprise (Viana et al. 2002; May 2006). Until recently, issues related to inter-ministerial coordination in policies contributed to significant deforestation. Thus, while the MMA has supported legislation promoting biodiversity conservation, the Ministry of Agrarian Development (MDA) and INCRA have promoted settlement schemes in the same landscapes. Indeed, the government land reform/settlement policies have had enormous impact on the Amazon forests in particular, which are host to about 62% of the area for resettlements, comprising nearly 50,000 families a year during its peak. The settlement policy also opened the way for widespread harvesting of timber through land clearance. In 2003, the Government of Brazil issued a Presidential Decree (3 July) creating the Permanent Inter-Ministerial Working Group for the Reduction of Deforestation in the Legal Amazon, whose mandate was to develop measures and coordinate actions to reduce deforestation. The Action Plan for the Prevention and Control of Deforestation in the Legal Amazon was developed. Following the development of the Plan: 19.5 million hectares of federal conservation areas were established; large highway projects in the states of Pará and Amazonas were halted; and monitoring and enforcement improved through strategic placement of enforcement staff and federal and military agents. Reductions in deforestation between 2004 and 2006 suggest that the Plan may be having beneficial impacts (Semarldi 2003; Banerjee and Macpherson 2009). USAID is supporting or has recently supported a number of conservation activities in Brazil. These include: 1) the Conservation in the Indigenous Amazon (ALDEIAS), the Ethno-Environment Protection of Isolated Peoples in the Brazilian Amazon, and the Indigenous Landscapes projects to support biodiversity conservation on indigenous lands; 2) the Forest Enterprise Cluster project, which focuses on sustainable production, forest monitoring, and collaboration with state and federal agencies on forest administration and management; 3) the FORTIS Consortium project, which aims to strengthen local capacity to deal with problems associated with the advance of the deforestation frontier; 4) the Friends of the Amazon Network to promote green procurement of forest products; 5) the Strengthening Environmental Management in the Brazilian Southwestern Amazon (MABE) Program to strengthen public participation in environmental governance; and 6) the Responsible Sourcing Cluster Program to help enforce compliance of the Forest Law and promote conservation of forests in soybean-growing areas of the Amazon (USAID n.d). As with water programs, the World Bank and GEF are supporting a number of biodiversity conservation programs in Brazil. The US $23 million Caatinga Conservation and Managemen Mata Branca Program (2007– 2012), implemented by GEF, contributes to the conservation and sustainable management of the biodiversity of the Caatinga in Bahia and Ceara by supporting: landscape planning and on-the-ground conservation and sustainable land-use practices; institutional and policy development for integrated ecosystem management; consolidation and expansion of the state’s protected area system; and strengthening the capacity of government agencies, NGOs, and communities to implement activities that protect ecosystems. The US $11 million GEF Rio Grande do Sul Biodiversity program (2009–2012) promotes the conservation and restoration of the biodiversity in the grassland ecosystem in the Rio Grande do Sul by mainstreaming biodiversity conservation within forestry, agriculture, and livestock production landscapes. The Ecosystem Restoration of Riparian Forests in Sao Paulo Program (2005–2011) is a US $19.5 million program designed to support long-term and large-scale restoration of the riparian forests in the Cerrado and the Atlantic Forest biomes. The program aims to promote policy and regulatory reform, improve local livelihoods, and enhance participation of local populations in conservation activities. The US $12 million Espírito Santo Biodiversity and Watershed Conservation and Restoration project (2008–2012) supports the adoption of environmentally friendly land-use practices in two key Atlantic forest watersheds in Espírito Santo by: establishing and strengthening watershed-management committees; improving protected area management; assisting landowners in the creation of private nature reserves; rehabilitating degraded areas; and stimulating the adoption of sustainable land-use practices that support biodiversity conservation and water services protection. The World Bank and GEF are also supporting the US $42.7 million Sustainable Cerrado Initiative (2009–2013) to promote biodiversity conservation and improve the environmental and natural resource management of the Cerrado biome through support for appropriate policies and field-based activities (World Bank n.d). Following the Government of Brazil’s Sustainable Amazon Program, the World Bank Group prepared the Amazon Partnership Framework (APF), which provides: 1) an integrated approach to address economic needs of the estimated 23 million people living in the Amazon; and 2) the infrastructure needed for local, regional, and national development; and conservation of the region’s natural assets. Specific programs include: 1) the scaling-up of the Para Integrated Rural Development Project (2006–2013), which aims to increase incomes of the rural poor by supporting small and medium-scale producer associations, and by supporting environmental management and land administration; and 2) the GEF Amazon Region Protected Area Program (ARPA II), which aims to expand and consolidate the protected areas system in the Brazilian Amazon region and implement mechanisms for their financial sustainability. The project builds upon ARPA I, implemented in the states of Acre, Amazonas, Amapá, Pará, Rondônia, and Mato Grosso and focused on: strengthening resource governance; creating and maintaining protected areas and indigenous lands; and developing methods to sustainably manage forest resources (World Bank n.d; World Bank 2008). The IFC is supporting the Brazilian Amazon Initiative, which is developing market-based incentives for the conservation of the Amazon, to reduce deforestation and promote biodiversity conservation, and to address poverty alleviation by promoting sustainable value-chain business linkages (IFC 2008). Other bilateral activities include the German Agency for Technical Cooperation’s (GTZ) Support for the Tropical Forest Protection Program. Focused on the Atlantic Forest, the Program supports legal reform to promote sustainable land-use, builds institutional capacity to better enforce these laws, and helps create economic opportunities for resident communities. In addition, a regional program (2007–2012) is assisting the Permanent Secretariat of the Amazon Rainforest Conservation /Amazon Cooperation Treaty Organization (ACTO) in cross-border efforts to protect the tropical rainforest. The regional program works with the eight Amazon Pact countries (Brazil, Bolivia, Colombia, Ecuador, Guyana, Peru, Suriname, and Venezuela) to build capacity of the ACTO and partners: enabling them to develop and implement a cross-border policy for sustainable natural resource management in the Amazon region in relation to marketing and trade of Amazon forest products; promoting tourism; monitoring activities; and coordinating conservation activities across states (GTZ n.d). Brazil has one of the largest and most well-developed mining sectors in the world. In 2005, Brazil produced 46 industrial minerals, 30 metals, and several fuel minerals for export (crude oil, natural gas liquid, natural gas, coal, and shale oil). Among those produced were bauxite, coal, copper, gemstones, gold, iron ore, and tin. In particular, Brazil contributes one-quarter of the world’s iron ore output and is the fifth-largest producer of tin globally. In 2008, Brazil produced US $103.1 billion worth of minerals, contributing to nearly 5.1% of the GDP. The mineral sector employs 6% of the Brazilian labor force. An additional 250,000 garimpeiros are engaged in the mineral sector (Business Monitoring International (BMI) 2009; Gurmendi 2007, 2010). Mineral resources are widely distributed in Brazil with many of Brazil’s mineral resources located on indigenous lands. In particular, many of the gold-mining sites are located in the Amazon region, along with considerable natural gas resources that remain untapped. The exploration, production, and exploitation of mineral resources is regulated by the 1967 Mining Code (Executive Law No. 227). The Constitution and the amended Mining Code, and Law No. 9,314 of January 1997 provide greater flexibility for private sector investment in the Brazilian mining sector than did the Constitution. The law allows the state-owned firm Petrobrás to enter into joint ventures with foreign investors (Gurmendi 2007, 2010). The Brazilian Financial Compensation for Exploiting Mineral Resources – Federal Royalty (CFEM), was established by the Brazilian Constitution in 1988 and instituted by Law No. 7,990 in 1989. It assures landowners, municipalities, states, and the federal government a share of exploited mineral resources in their respective territory or financial compensation for this exploitation. The Constitution’s Article 225 stipulates that mining operators must reclaim areas that were environmentally degraded during the mining operations (Gurmendi 2007). The Constitution recognizes artisanal mining as a legal form of mining exploitation. It assures the garimpeiros the mineral rights to deposits (Art. 174, regulated by Law No. 7,805/89). It also establishes the right to form cooperatives (garimpos), providing rights equivalent to a formal mine. The garimpos are required to obtain mining permits, and their activities are limited to areas of 50 hectares (Hanai 1998). The government permit and concessions systems are differentiated by the type of deposits that might be worked by the garimpo versus the mining company. Also, unlike concessions for mining companies, the issuance of permits does not typically require mineral prospecting studies. However, the garimpeiro, as is the case of the mining companies, are required to request environmental licensing from the State Environmental Department or IBAMA; the environmental licensing builds upon an environmental impact study of the proposed mining activity. The provisions regarding garimpos apply to individuals and cooperatives but exclude small- and medium-size mining companies. Thus, many small and medium size mining companies have evaded the mining regulations. Furthermore, laws regarding the granting of permits and concessions remain vague. Thus, the government will only grant concessions for mining of some mineral deposits such as alluvium, eluvium, and colluvium regardless of who is granted the license. This implies that the garimpo mining permits may require mineral prospecting studies in certain instances. The difficulty of distinguishing between the permit and concession systems has led to persistent conflicts between mining companies and garimpeiros (Barreto 2001). The Constitution states that the mineral resources, oil, gas, and other resource deposits belong to the federal government, which retains the right to prospect, drill, and exploit these fields. It retains the authority to grant concessions for exploration and mining of mineral resources. The garimpos have priority in areas where they operate and those established by the federal government (Cawood and Macfarlane 2003). Currently, Brazilian corporations, private Brazilian and foreign investors, and government-owned companies partially or wholly own a major portion of the mineral industry. The exceptions are the natural gas and petroleum industries, which are 100% government-owned through Petrobrás and its subsidiaries. The government had monopoly over the oil and gas industries until 1999; since the amendment of the Mining Code, more than 500 transnational corporations have established operations in Brazil via mergers, joint ventures, and privatization (Gurmendi 2010, 2007). Historically, artisanal and small mining were linked with high-value minerals, gems and metals. In 2008, 55% of the diamond and gemstones were mined by garimpeiros, and 45% by the private sector. In terms of gold, garimpeiros produced 10.4%, while the mining companies produced the remaining 89.6%. More recently, the garimpeiros are extending operations to other minerals such as gravel and sand, and clay. Among the 2,367 total mines that hold legal tenure in Brazil, 1,706 (72.8%) are small-scale operations. It is estimated that a similar amount of informal artisanal and small mining operate in Brazil (Gurmendi 2010; Peiter 2006). Garimpeiros often come into conflict with indigenous communities as they exploit indigenous lands for mining. Environmental impacts in the form of deforestation, siltation, and chemical pollution of land and water, affect both the indigenous communities and the garimpeiros. Pollution from mercury used in gold mining poses serious health hazards for miners and indigenous communities residing in the vicinity of mining areas. The National Department for Mineral Production (DNPM), subordinate to the Ministry of Mines and Energy, is responsible for: the administration of all mineral rights; planning and development of mineral exploitation; and management of mineral resources and control of mining activities throughout Brazil in accordance with the Mining Code and supplementary regulations. The National Oil Authority issues exploration and production licenses and regulates the petroleum industry. Private investors continue to operate on a subcontract basis in the petroleum sector (Gurmendi 2007; Cawood and Macfarlane 2003). The government has promoted the participation of the private sector in mining by supporting joint ventures and privatization. The federal and some regional governments are also attempting to establish positive relationships with artisanal and small mining enterprises in an effort to alleviate poverty and create jobs, and address concerns regarding poor work conditions and environmental impacts. Work is still needed in clarifying rights and responsibilities of artisanal and small mining enterprises, and in facilitating and regulating their activities (Gurmendi 2007; Peiter 2006). USAID does not have investment or involvement in the mining sector, nor does it have any plans to work in the sector. Traditionally, the IFC has supported the chemical industry in Brazil. IFC’s early investments helped to establish some of Brazil’s first petrochemical complexes, promoted under the three-way ownership scheme (state, private local group, foreign multinational). The IFC does not anticipate active participation in this sector. The World Bank anticipates investing in the mining sector on a selective basis, focusing on supporting junior mining companies, supporting Environment and Sustainability and corporate governance, and in mitigating anti-mining issues (World Bank 2008).